TeSSH is a fully scriptable and highly advanced SSH and Telnet client for Windows. It includes both the LUA scripting engine, as well as the zScript scripting engine (from the CMUD and zMUD clients). Full VT100 and xterm emulation is provided, including 256 color and mouse support. Integrated SFTP support is also provided. 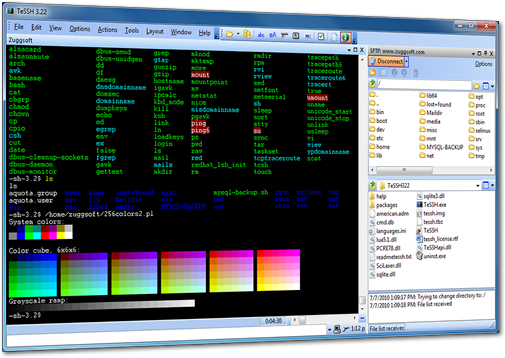 A Windows SSH client is used to connect to remote computers. IT professionals, such as system and network administrators, need to use a SSH client to connect to these remote computers securely. TeSSH includes many features designed to increase your efficiency when managing these remote systems.